Carcassonne, the ancient cité, a little illustrated history. Standing atop the ramparts of La Cité, the walled medieval city of Carcassonne, the traveller can appreciate why the Romans chose to build an important camp on this site. The Pyrénées and the Montange Noire come close to meeting here, and the promontory now crowned by this fairy tale castle guards the main route between the Atlantic and the Mediterranean, known as "La Voie Aquitaine"
No longer needed for defense, the great walls of La Cité became quarries for newer houses, a decimating process that was not stopped until the mid nineteenth century when Prosper Merimee and the newly founded Historic Monuments Commission engaged Viollet le Duc to restore La Cité to its former grandeur. 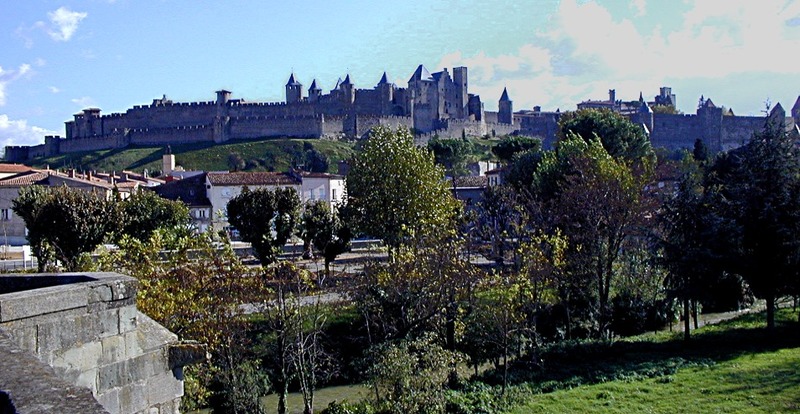 Whether Carcassonne was restored to its original plan or recreated by the imagination of Viollet le Duc is hotly debated. Suffice it to say that La Cité is the third most visited place in France (behind Paris and Le Mont St.Michel) and is the largest walled medieval city in Europe, with more than fifty towers and three miles of walls. Only one entrance for motorized vehicles (the Narbonne Gate) exists, and it is closed during the summer. During that season, only pedestrian access is permitted. The logical place to start a visit to La Cité is the Château of the Counts, which contains a museum and is the main access to the ramparts. Because there are so many different types of construction and stonework, it helps to follow one of the guards on a guided walk along the walls. The tour starts at the chateau and ends at the Basilica of Saint Nazaire, which may have the most beautiful stained-glass windows in the Midi. The walk takes about an hour and is not strenuous, although those afraid of heights may pale from time to time. It is also interesting to walk in the lists (the area between the inner and outer walls). There are several entrances, but, as the local authorities are inclined to close these without notice, it is a wise idea to check with one of the residents before entering. The rest of the walled city is given over to tourism. Visitors will find endless souvenir stands, créperies, cafés, and wine tasting shops, where the local wines may be sampled. In summer (especially on Sundays), scores of buses disgorge thousands of visitors. Try to come early in the morning to avoid the crowds and to catch a glimpse of the Pyrénées from the walls. Copyright : © 2010 - 2018 Sysnix Consultants Ltd. All Rights Reserved.